04/08/2019 New Guidebook 2019 Issued! 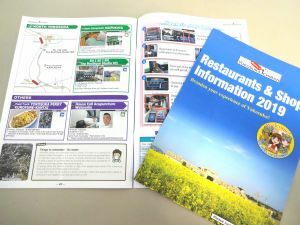 A new guidebook "Restaurants & Shops Information 2019" has just been issued. Basic information about restaurants and shops that are registered as a member of the "Yokosuka 1chiban" is included in the guidebook. Guidebooks are available at many locations in Yokosuka including Yokosuka US Naval Base (Fleet & Family Support Center, ITT, CFAY Public Affairs Office), Mercure Hotel Yokosuka, Hotel New Yokosuka, KEIKYU EX INN-Yokosuka Research Park, The Yokosuka Chamber of Commerce & Industry. We hope this guidebook will help you broaden your experience of Yokosuka.